William S. Hart was the first great cowboy hero of film. Tall, grim, and melancholy, he was a strangely Hamlet-like figure playing a rough, tough protagonist; but it was this mixture of deep feeling and freewheeling action that made his movies interesting, and imprinted him on the public consciousness. "The Bargain" -- the epic landscape. This, his third Hollywood venture, is his breakthrough film. Long a respected Broadway actor specializing in Shakespeare (he was the original Messala in the stage adaptation of “Ben-Hur,” real horses and all), Hart thought he’d try his luck in the movies at the age of nearly 50. Hart had traveled in the Old West as a boy, and the way the movies portrayed cowboy life struck him as deeply inauthentic. He thought he could do better, much better. Fortunately, Thomas Ince saw something in him. Both men were right. The girl, Hart, the father. Ince was the first great film producer, a massive and tasteful success who conceived of putting all aspects of film production and distribution in one physical location. He did so at the site of an old ranch at Sunset and Pacific Coast Highway, eventually ruling over 18,000 acres in the Pacific Highlands dubbed “Inceville.” The movie studio was born, and Ince lived in a house literally above it all. Ince’s brilliance served Hart well. Westerns had already proved profitable. The first cowboy star was “Broncho Billy” Anderson – originally Max Aronson from Atlanta. Broncho Billy starred in dozens of popular short films, but he was a figure of convenience. If the scenario dictated that he play Billy as the hero, he would; if it was Billy as the badman, so be it. He had a name but no persona, that set of rules about a character that give it integrity. Hart was different. He had literal stature and his face was classic, with sharp cheekbones, a Roman nose, and a soulful look in his eyes. 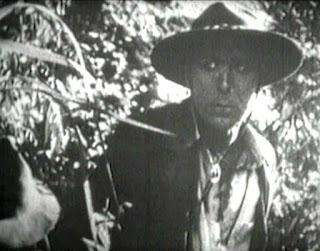 Here, as in most of his subsequent films, Hart plays the “good bad man,” the outlaw redeemed by suffering, a woman’s love, and/or the word of God. While not blatantly Christian, Hart’s films seem as much moral fables as they do shoot-‘em-ups. Here’ Hart is Jim Stokes, the Two-Gun Man, a clever bandit who, wounded on the run from the posse, staggers to the Brent ranch, falling in love with the daughter there (and she him). Fortunately, the traditional donkey-riding eccentric minister shows up, and they are wed. Jim wants to return the money he stoles from his last holdup, and goes to town – where he is promptly captured. Again fortunately, the sheriff loses all the stolen money at the roulette table, and he and Jim make a deal. Jim robs the gambling hall, gives the sheriff back the money, and is set free with his beloved. It’s a simple story, but it works. 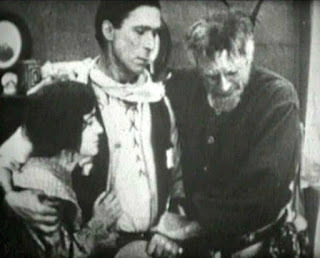 Director Reginald Barker was one of Ince’s stable of dependable directors; here, he gives Hart the time he needs to emote during a scene, a very slow kind of take opposite to the convention screen acting of the time, sharp and strong. Hart is melodramatic – there is nearly always a tension in his stance. He keeps his face still, almost a deadpan, and it invests his underplaying with intensity, as though something might suddenly happen. There’s almost a feminine energy in his low-key suffering; at other times he seems like some hypermasculine forest spirit; a vengeful cowboy ghost. Ince’s good eye for talent includes using two great early cinematographers here, in each of their first films – Robert Newhard and Joe August. August, particularly, is known for his outdoor work and his low-level lighting achievements – tricks he learned out of necessity. 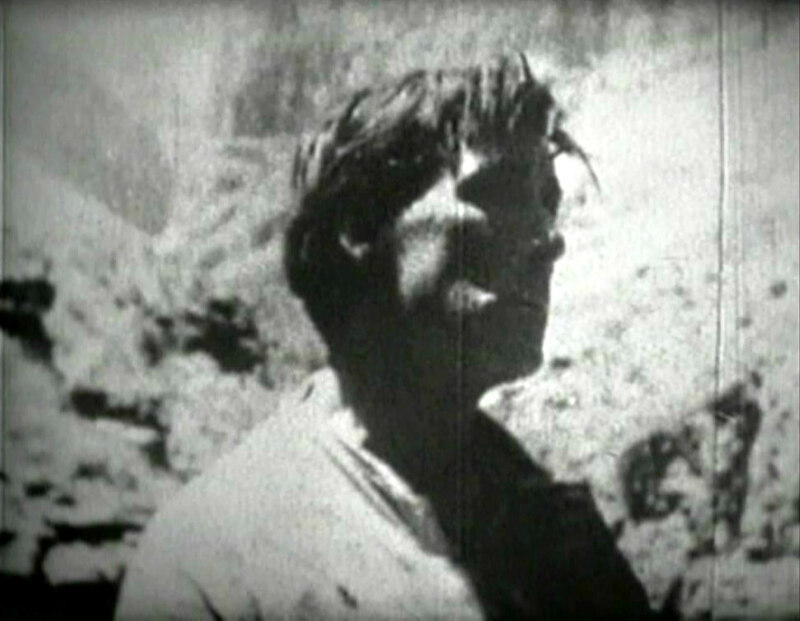 There are many beautiful compositions in “The Bargain” – valley views centered on Hart’s roving figure, textured rock walls through which he wanders, and equating his heroic profile with the heroic landscape behind it. 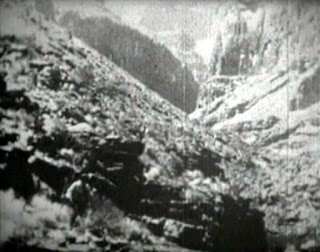 Surprisingly, here’s the earliest 360-degree pan as well. 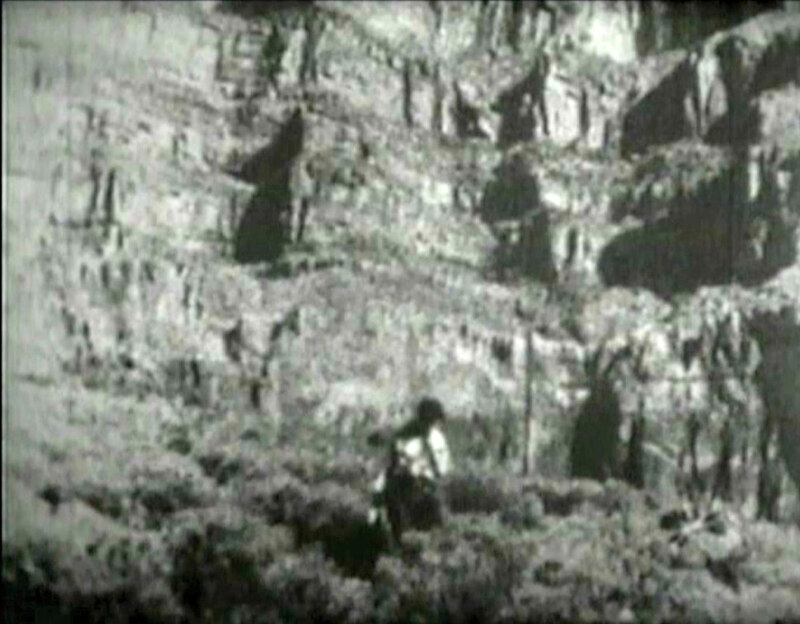 Most think it to be in Buster Keaton’s short “One Week” in 1920, but here a little over 38 minutes in, the Border Rest Saloon and Gambling Hall gets the full once-over, the adventurous cameramen somehow cranking the projector and stepping through a full circle at the same time, while the actors stayed focused on establishing action in the background. It’s a remarkable move for its time. Perhaps the rarity of the film has kept this from being noticed to date. 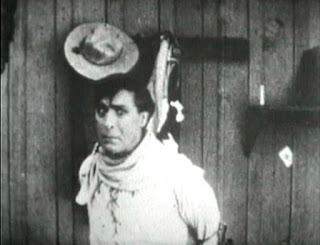 Hart would make 70 films, most Westerns, through 1925. Joe August shot more than 40 of them. Ince died mysteriously on his yacht in 1924. 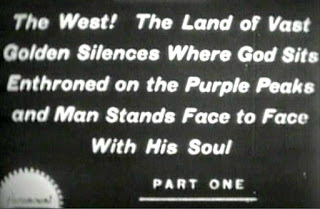 The Western continued to grow in popularity, but with the rise of Hart, it began to grow in depth and complexity, too. Hart was the original "strong, silent" type. He worked the paradox of, one one hand, being a manly ideal -- a "man" in Western culture being a heroic one who fights and dares, wins and loses -- and being human, a flawed, feeling person. It's a dynamic that would inform the performances of his cowboy-hero descendants such as Gary Cooper, Henry Fonda, and John Wayne.